Lighting is extremely important in all areas of business, having the right levels of office lighting not only improves the workspace experience, but is also essential and may even resolve some health issues. Similarly creating the right mood in an area is very dependent on the lighting chosen and has a significant effect on business. During any refurbishment project we offer guidance and work with the client to create the lighting levels and ambience required. This can include general lighting of areas such as offices or washrooms, through to shop fronts and signage. 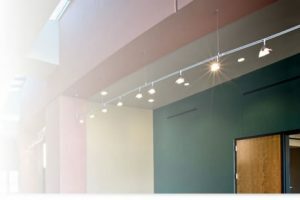 Over time lighting performance deteriorates for several reasons, these can be simply the life of bulbs or accumulation of dust, but even repositioning of furniture and partitions can affect how light gets to the areas required. It is essential to look after your lights, George Benson Ltd offers competitive cleaning, maintenance and repair contracts to maintain lighting levels and rapidly resolve any lighting issues.